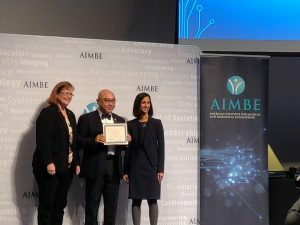 Congratulations to Chenzhong Li who was inducted as AIMBE Fellow! Chenzhong Li is the Worlds Ahead professor of biomedical engineering, the director of Nanobioengineering/Biosensors Lab and an affiliated faculty in the Department of Chemistry/Biochemistry and the Department of Immunology. He currently is the program director of Biosensing program at National Science Foundation. Dr. Li is an expert in bioinstrumentation and bioelectronics, specifically in the development of biomedical devices for both diagnostic and therapeutic, which could also have cross-applications for environmental, food safety monitoring, agriculture, and homeland security. Dr. Li’s research interests include biosensors, in vitro diagnosis, Point Care of Testings, neuron-device interface, cell/organ on a chip, electric therapy and electron transfer study of various biomaterials. The impact of Dr. Li’s research has been documented in 10 granted patents, about 140 peer-reviewed journal papers with H-index 43, 2 books, 7 book chapters, over 110 keynote/invited lectures and seminars at National/International conferences and institutions. Dr. Li was the Co-Principal Investigator of two newly funded NSF Engineering Research Centers (ERCs)-PATHUP and NERC-CELLMET, with focus on developing smart health diagnosis system and artificial heart tissues. 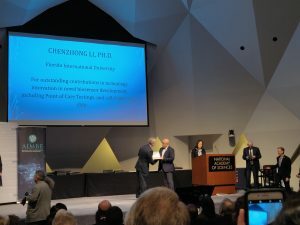 In recognition of his work, Dr. Li has received several awards and honors including the Kauffman Entrepreneurship Professor Award in 2009 and 2011, 2014 JSPS (Japan) Professor Fellowship Award, 2014 FIU Excellent Faculty Award in Research and Creative Activities, 2016 Pioneer in Technology Development Award by the Society of Braining Mapping &Therapeutics and Brain Mapping Foundations, 2016 the Finalist for FIU President’s Council Worlds Ahead Award, and 2016 Minority-Serving Institution Faculty Award in Cancer Research, by American Association for Cancer Research (AACR). Dr. Li is the associate editor of several flagship journals including Biosensors and Bioelectronics, Microsystems & Nanoengineering, etc. and the Editor in Chief of the journal of Critical Review in Biomedical Engineering. He is the elected fellow of the American Institute for Medical and Biological Engineering (AIMBE) and a senior member of IEEE. After Dr. Li received his B.Sc (Material Engineering), M.Sc (Electrochemistry) and Ph.D (Bioengineering, 2000) from Kumamoto University in Japan, he carried out post-doctoral research in Molecular Biology at the University of British Columbia, worked at a startup company Adnavance Technologies, Inc. as a Professional Research Associate, then started his career as an independent PI as a Research Officer at the Nanobiotechnology/Biosensor Group of Biotechnology Research Institute (Montreal), Canada National Research Council till 2006.